I hope everyone is having an awesome week. I had a big response from my Morning Routine, so thank you to everyone who got in touch, I love hearing all your feed back, and also how other people's routines differ. I just want to say my skin type in the summer is Oily, and I suffer with break-outs, all the products I use are beneficial for Oily skin unless stated otherwise. My Evening Routine takes more time than my Morning Routine, but I use less products. I like to make sure I'm treating my skin in the best possible way and using the most effective products, when you sleep your skin is given the time to recover and rejuvenate, so you want to use the most effective products in order for this process to happen. I start with removing all of my make-up and any other product I have on my skin, this gives me a fresh base to start applying all my evening skincare. To do this I'm currently using Ultrabland. Ultrabland contains ingredients such as; Honey, which is Anti-bacterial, Bees Wax, which helps all remaining product on the skin the stick to it, making it easier to remove and Almond Oil, which is packed with vitamins and minerals. I honestly swear by this product, it removes make-up so easily, even the toughest of mascara's! The skin is left feeling squeeky clean and protected, I love it! It's one of my top favourite cleansers as not only does it cleanse but the bees wax leaves the skin feeling so soft and hydrated. After I've removed all my make up and have a fresh face I then apply my face mask, I'm currently using Facetox, they have created a mask that is by far the best I have ever used. Personally, I prefer to apply my mask at night so the ingredients have time to really sink into my skin and do their job, rather than me going ahead and putting makeup straight on freshly aided skin, seems a bit pointless. In the box you get 7 Masks, each Mask Face contains 2 ingredients in packets, the first is the Mixed Facetox Blend which is the Aztec Clay. Aztec Clay is one of the most beneficial clay masks as it is made from natural bentonite clay. They draw out impurities as well as helping to clear up acne. The second is the Organic Rose Water. Organic Rose Water is anti-inflammatory helping to reduce redness in inflamed skin as well as fighting acne, eczema and dermatitis, it it also a great cleaner! Once mixed together they create a paste which you apply all over the face, and neck, if you suffer with problems in that area. Leave the Mask on for any time between 10-20 minutes and then remove with a warm cloth in circular motion. 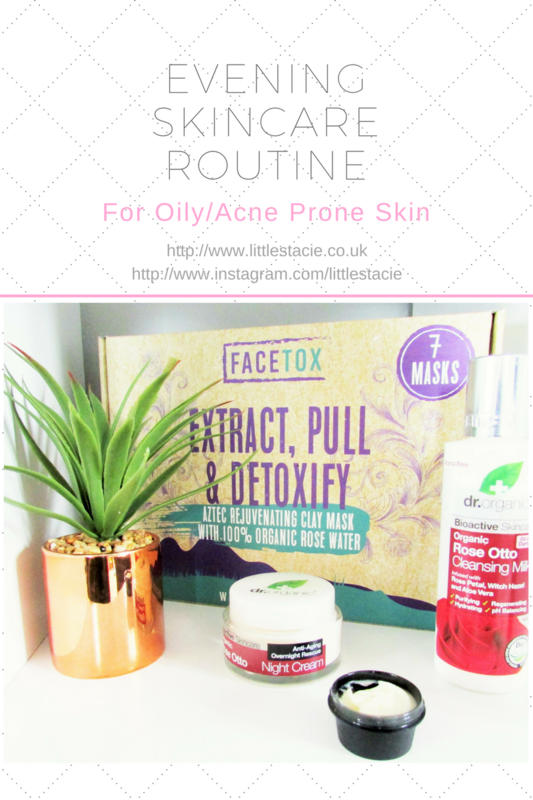 My skin has improved so much since I've added FaceTox to my skincare routine and they can be used on any skin types. Next I apply my toner, this helps to minimise my pores and remove any excess mask that is left on my skin. The toner I use is Organic Rose Otto Toner from Dr Organics, it's so light and refreshing on the face and helps to reduce any redness left from applying the mask. Because my skin is oily and I suffer with break outs, I'm left with a lot of redness so this is why I use a lot of Rose products to help calm my skin. Last of all I apply my moisturiser, I'm currently using Organic Rose Otto Night Cream, it's important to use a night cream rather than a basic moisturiser as the properties will help penetrate the skin better therefore being more beneficial. If you were to use a day cream/normal moisturiser, it would still work put not to the extent a night cream would. I love this moisturiser, it feels light on the skin and I wake up glowing. I just want to state that all the products used above are Vegetarian Friendly & Cruelty Free. I hope this helps anyone that has the same skin type as myself, if anyone wants me to do a basic routine for other skin types then I am more than happy to do so and recommend products that I believe will be beneficial for your lifestyle.